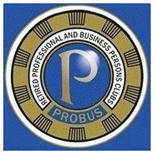 Ewell Probus is an autonomous Club for retired or semi-retired professional and business people. We meet for lunch on the first Wednesday of each month at the Banstead Downs Golf Club, Cheam. Every May and December we have a Ladies Lunch and meet at the Kingswood Golf Club, Kingswood. The next committee meeting will be held during the morning of Monday 29th May 2019.